By now you might have gotten an idea that I am kind of obsessed with the brand Makeup Revolution and I can justify it for sure. Its cheap, the quality is good, the variety is huge, they come up with dupes of almost everything out there and the packaging is super cute (basically the reason I buy it, rest comes after it). By now I have quite a lot of products from the brand, some have been good, some not so good and some got me hooked for life. Being a non-eyeshadow person, I am amazed that how much I have been wearing it lately from past couple of weeks, thanks to the latest edition in my vanity the MakeupRevolution Reloaded Pallette. Today we are going to talk about it and why I am so in love with it. 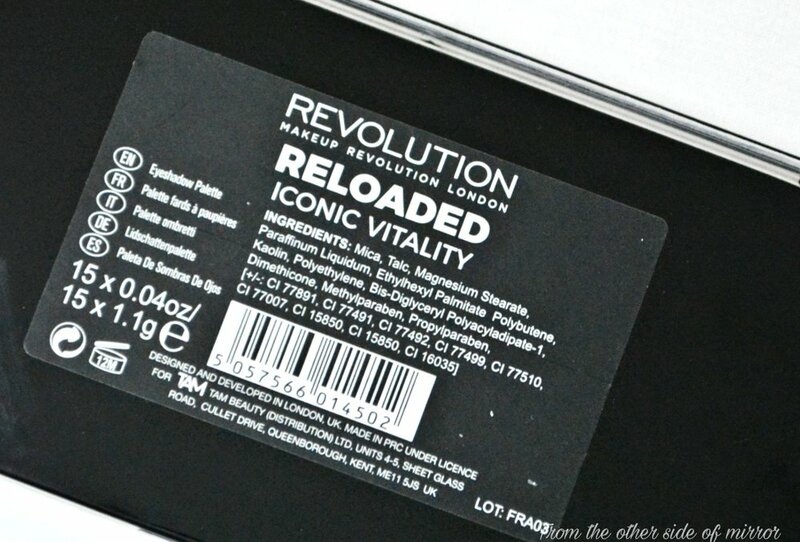 The MakeupRevolution Reloaded palletes come in a basic black plastic packaging with a clear lid that clicks close securely and needs quite a bit of effort to open it up. There is nothing fancy about the pallete and also not too sturdy to be thrown into your bag and not be concerned about it. The pallete comes sealed in a plastic wrap hence there is no box with any descriptions or shade names/numbers on it. Whatever it is, its on the back of the pallette. This might be a bummer for a few people but what lies inside just makes you overlook everything else. The product comes in a 15 rectangular closely packed pans with a total of 16.5 gms of product (making it almost 1.1 gm of shadow in each pan!). The shadows look super gorgeous in the pan and the theme of each pallette is very organised and complementing to each other. The formula varies from shade to shade, but generally these are very smooth and creamy in texture, really pigmented and blend nicely. These are super easy to swatch and even easier to pick up on the brush. I kid you not when I say a single dip in the pan picks up enough product to do your 1 eye seamlessly without going back into the pan. There is a little kick back in the pan when you dip the brush, but I think that's OK and happens with all so we can kind of ignore that. The fall out is minimal when applying given that you tap off the excess before applying. One thing that I kind of don't like is that there are no shade names or numbers to refer to shades in the pallette so when you are telling someone about the shades you have no idea what to refer them to. Anyhow thats just a little hiccup I feel. And hope they'll work on it. I have the relaoded pallete in the shade Iconic-Vitality which has a mix of pinks, browns, golds and a classic black. The finish varies from mattes, shimmers and satins which make it a diverse pallette to use from day to night creating subtle day time look to dramatic smokey for evenings out. The pallete is said to be a dupe for the cult favourite ABH Modern Renaissance pallete which has very similar colors. Since I don't own the later I can't compare the two but looking at comparison Swatches online, the similarities are undeniable. My favorite is the matte pink and shimmer gold in the second row, and the burgundy and burnt orange in the second row. These colors are very versatile and I love playing with these. The matte black is so hard to be done right and usually translates more like a dark grey. But in this pallete, it is super black that you can double up as a smoked liner. Throwing in a basic matte black usually completes the whole pallette and makes it more put together. All in all, I am in love with this palletes and it has been my constant companion during travelling. Recently I took it along with me for Eid and never for a moment I felt that I was lacking some color or needed any other pallete to complete a look I had in mind. Absolutely gorgeous pallette, super affordable, diverse color selection and great pigmentation & texture. I would definitely recommend this pallete and also checking out other options in the same palette. HAVE YOU TRIED THE EYESHADOW PALLETES FROM. MAKEUPREVOLUTION YET? WHICH BRAND IS YOUR FAVOURITE WHEN IT COMES TO EYESHADOWS? LET ME KNOW IN THE COMMENTS BELOW.